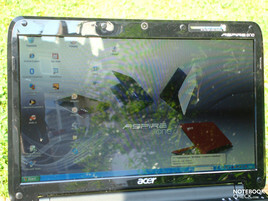 Acer brings into play a format so far untypical of netbooks with the 11.6" Aspire One 751 and calls it a "Widescreen Netbook". Image and sound are supposed to be rendered especially "breath-taking" through this niche model, not leaving anything to be desired. Our review shows how the new form factor acquits itself in practice and compared to the competition. 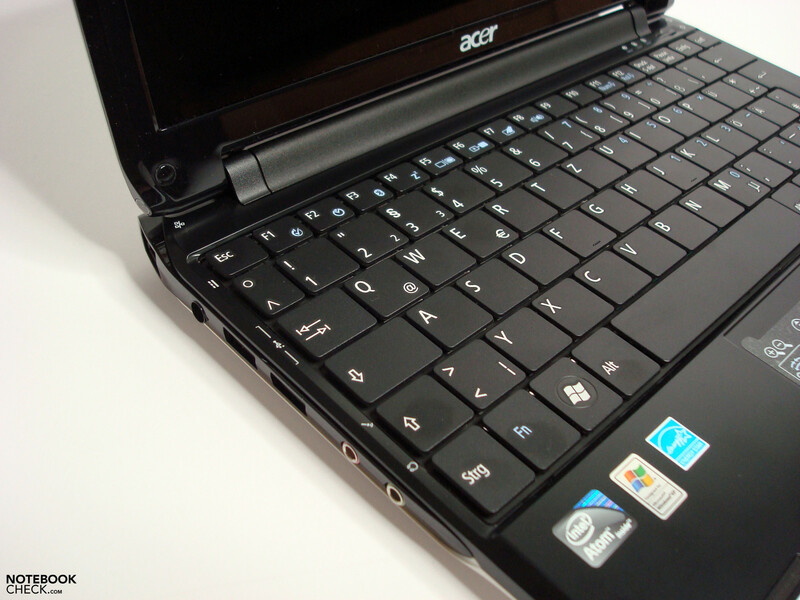 Acer is offering a widespread range of netbooks by now, from the 8.9" Aspire One A110 up to the most current scion Aspire One 751, and they can boast with some unusual distuinguishing marks. 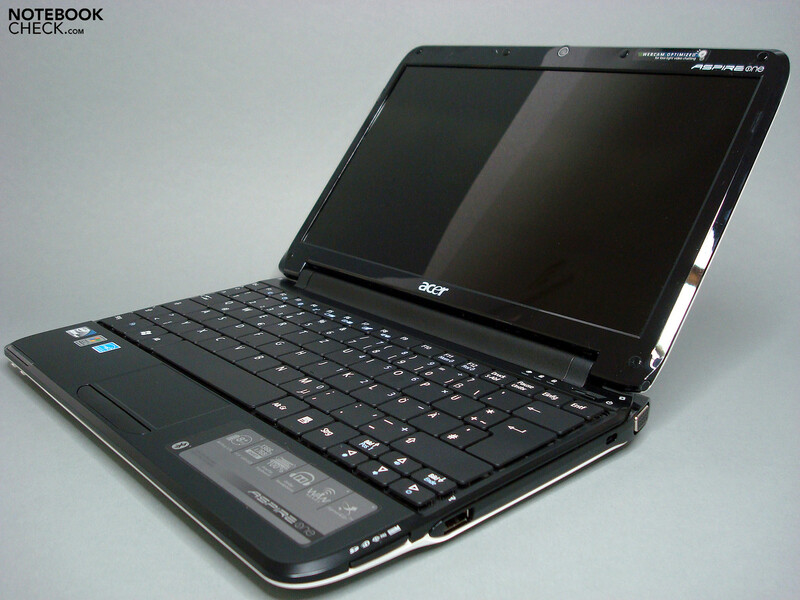 While models with integrated UMTS module, such as the Aspire One A150X, are also available from the competition, Acer offers a pro-version of the Aspire One 531 with Windows XP Professional and 250 GB hard disk (or 64 GB SSD). 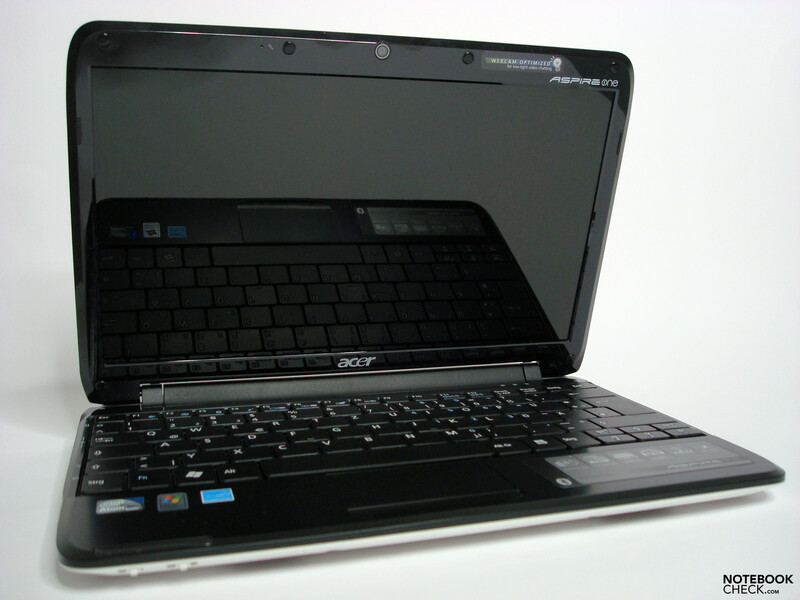 They also offer the now reviewed Aspire One 751 with an unusual 11.6" WXGA display, and the Intel Atom Z520 CPU. 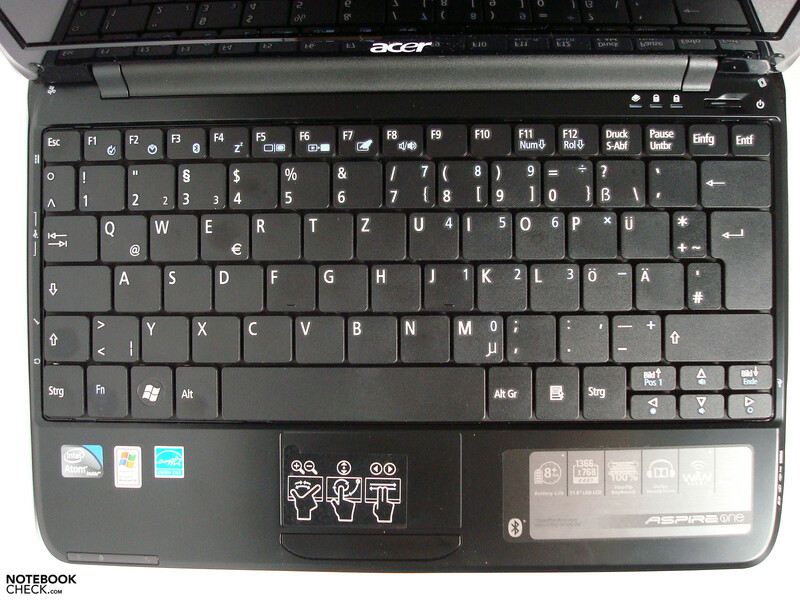 The configuration of the Aspire One 751 we tested features the especially economical US15W chipset together with the Intel GMA 500 graphics chip, and is consequently aligned for low energy consumption. 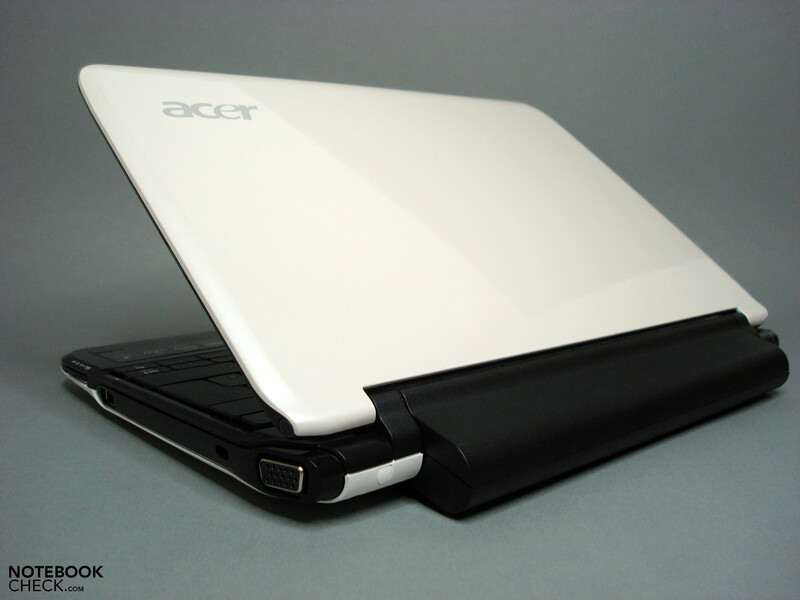 Acer provides the extremely modest hardware with a lush 54Wh battery in order to reach the promised battery life of up to 8 hours. 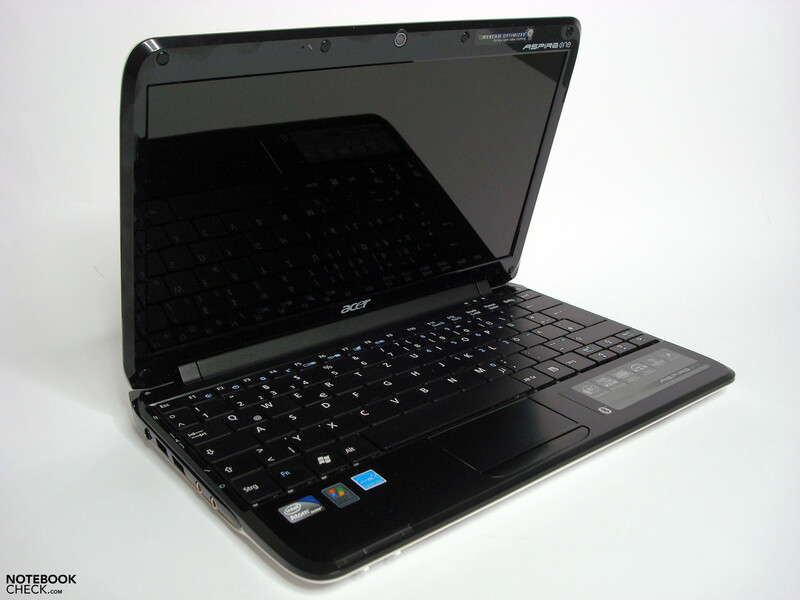 Although they do not sheer off too far from the netbook-faction with 1 GB system memory, 160 GB Hitachi hard disk, Windows XP Home, and the common ports, a clear signal is indeed set with the price of 429 Euros. 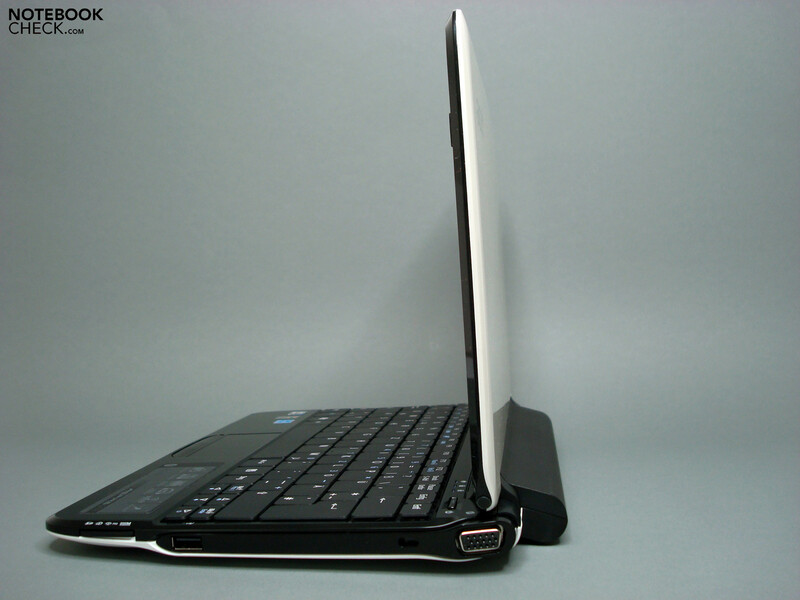 The test model we had shows an easy-care "shell-white" on the outside, and a silky matt black at the work space. The display's frame is lacquered glossy, but it is less irritating than that of the one or other competitor, due to the comparatively small dimensions and the slanted side parts. 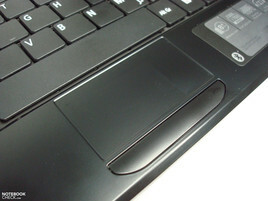 The white surface is (as it already was on the Lenovo Ideapad S10e and the Asus Eee PC 1000HE) pretty unpretentious and conceals dust and finger prints comparatively well, unlike darker lacquerings. Thus, the good-looking book stays appealing for a long time and only needs cleaning and polishing every now and then. The slim and flat case follows the new Slimline-trend with dimensions of 284 (w) x 198 (d) x 25.4 (h) mm. 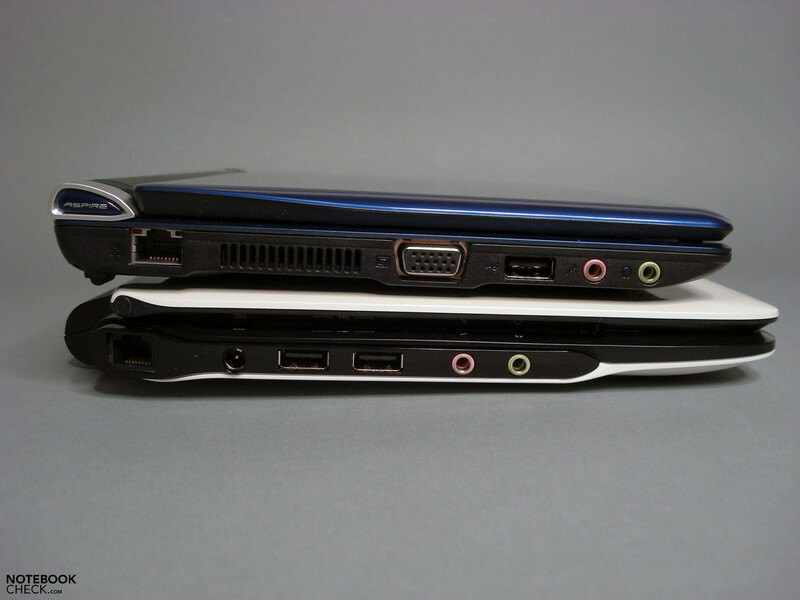 It is only about 2.5 cm wider and 1.5 cm deeper than the Aspire One D250 (which was tested by us at the same time), while the height is equal. Moreover, it undercuts the one or other competing 10" model with a weight of 1380g (6-cell battery). 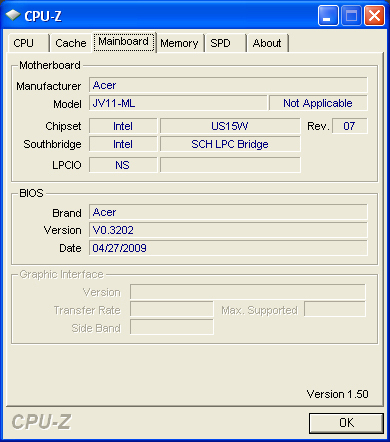 Compared to the Asus Eee PC 1000HE netbook tested a couple of weeks ago, it for instance amounts to about 80g. Slim, light-weight, good-looking... These attributes barely have negative influences on the built quality. The tidily manufactured case features high torsional stiffness and resistance to pressure in the area of the base unit. Here, little can be dented, bent, and few noises can be elicited. The display lid can albeit not quite confirm this level, but has to be described as good anyway. Strong pressure, applied to the outer skin of the panel, leads to waves on the display, and a reversed twisting of the panel's corners leads to a slight creaking. However, these are exposures that scarcely happen in the usual daily routine, and thus normally do not lead to any limitations. The display's hinge very solidly and firmly holds the panel in position and thus presents another clue towards the qualitatively good built. The lid can be closed single-handedly, but one needs a second hand for opening so the chassis will not also be lifted. As on the Aspire One D250, the underbody features a roughened, very robust surface and harbors three openings secured by few screws. 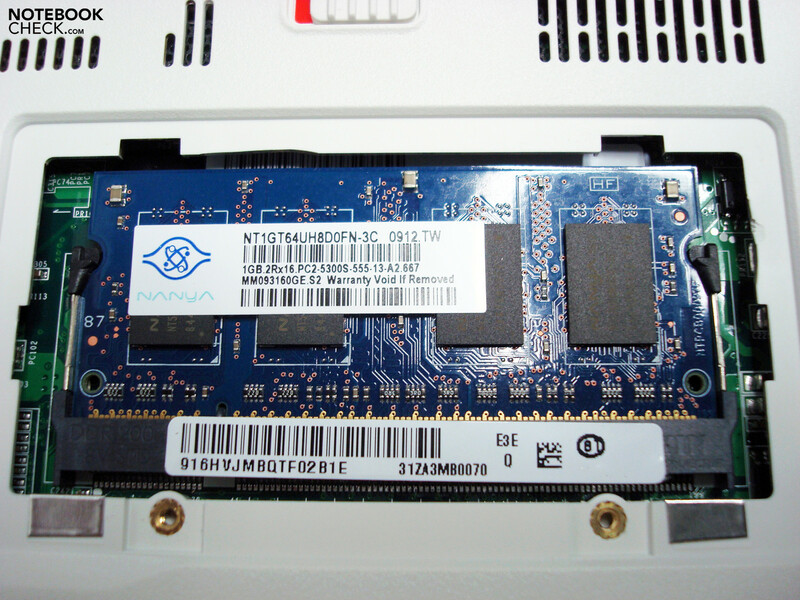 Underneath, one finds the system memory, the hard disk, and the free slot for the UMTS-module available in future configurations. 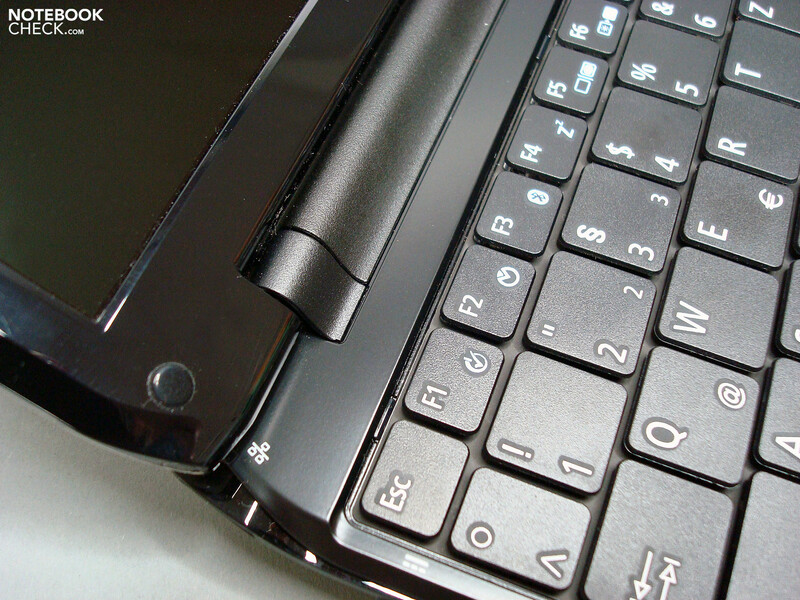 The 6-cell battery featured in our model jacks up the device by a few millimeters in the rear area and thus leads to a slightly inclined position of the keyboard. 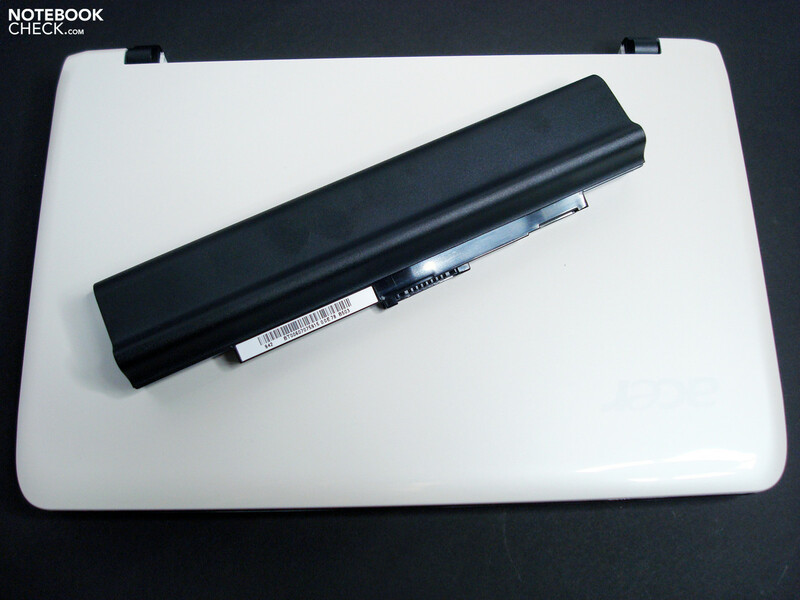 The notebook stands on the ground flatly with the also available 3-cell battery, which is flush mounted, or without a battery at all. We could not find any flaws of workmanship on our test model. 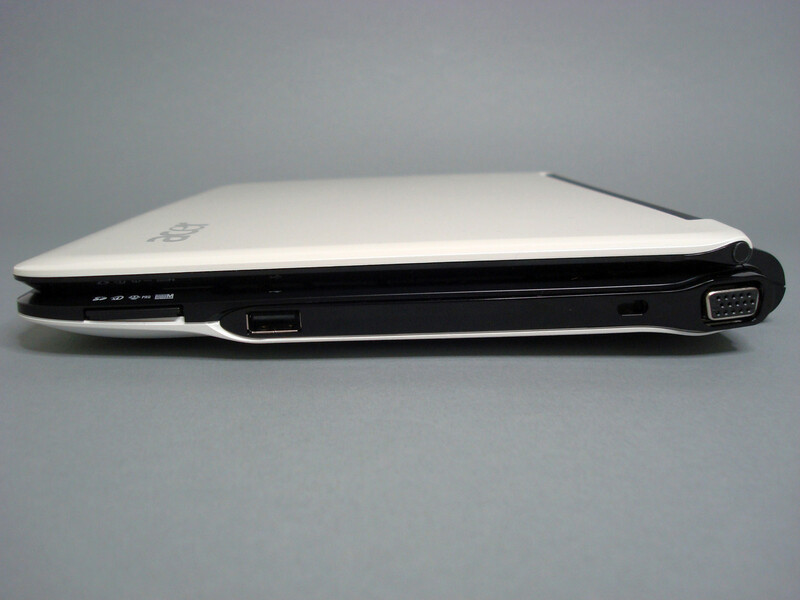 The 11.6" widescreen netbook features the ports common for its class and thus provides good connectivity. 3x USB 2.0, an analog VGA port, audio in- and output, ethernet, multi-in-1 card reader with a good coverage of formats, and a Kensington Lock should be enough for most demands. 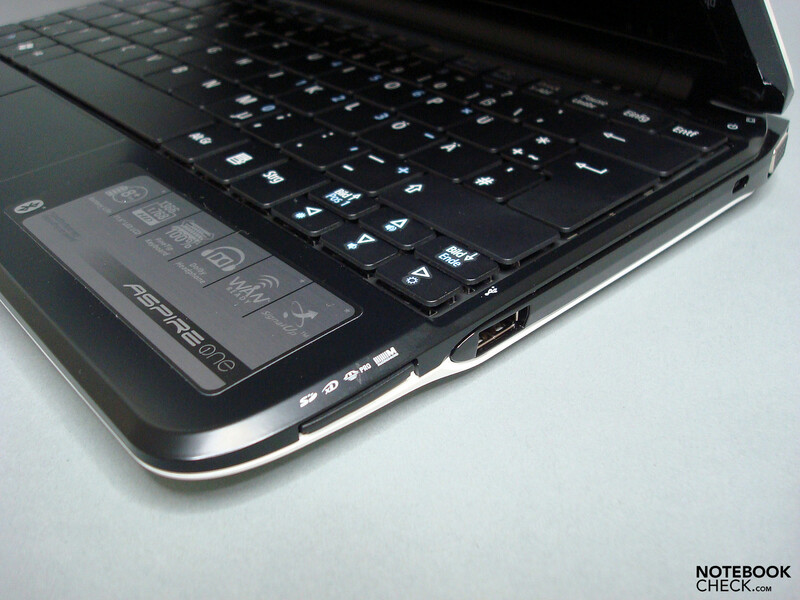 The positioning of ports is far better than that of the already mentioned little brother Aspire One D250. We would admittedly have liked a more practical positioning of the audio ports on the front side, but the USB ports alone compensate for this - they are located far towards the rear of the left side and are far enough apart from each other (6mm). Therefore, a USB-cord of normal width (hard disks, printer, extension) can still be used next to an over-wide USB-stick (UMTS, TV, storage). The VGA-port is also appealing, it has been moved towards the rear side and causes as few limitations as possible through the fixation of the cable when an external monitor is connected. We cannot fully understand why the USB port has been implemented on the front side next to the card reader in spite of lushly available space, collisions are easily possible when a USB-device is connected and the mouse is used at the same time. It's good that there is a practical possible alternative on the left side. The user has both WLAN and Bluetooth at his disposal when it comes to wireless connections, so both wireless networks and wireless Bluetooth devices, such as mice, cell phones, etc. can be used. The already prepared UMTS-slots that would make mobile internet access possible are not yet occupied. 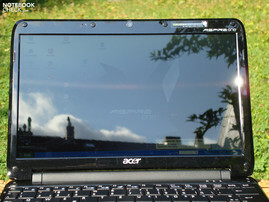 Here, the user either has to order a corresponding module via Acer's technical support (Info Acer), as long as it is available, or choose a solution by a third-party manufacturer (such as UMTS-USB-sticks). The smaller 3-cell battery is admittedly not yet available, but is (according to Acer) supposed to be available in the Acer-Store or via specialized trade in the future . The standard-sized keyboard takes up all the space and offers a solid layout with a labeling rich in contrast and therefore does not pose anybody a riddle. The most important additional functions, such as controlling display brightness or volume, are of course not missing either. The keyboard with medium stroke albeit does suffer a little from an insufficient substructure that permits strong sagging in the area around the middle. Slight vibrations are thus already noticeable at a normally strong stroke, one sees how the whole area of input sags. This will certainly displease those typing a lot in the long run. The keys' mechanics are openly accessible, which seems disadvantageous as well - it does not offer sufficient protection against the intrusion of small foreign particles. We albeit like the lateral ports' labeling, which appears on the case's edge. Using the ports becomes so much easier by estimating the position in top view and allows for quickly connecting external peripheral equipment without dislocating one's neck. The sufficiently large touch pad, which is very appealing in terms of touch, is gladly used as mouse replacement due to its good responsiveness and sliding properties. Although the multi-touch functionality is by far not comparable to that of Apple's MacBook, it can provide the one or other appreciated extension of the normal range of functions. 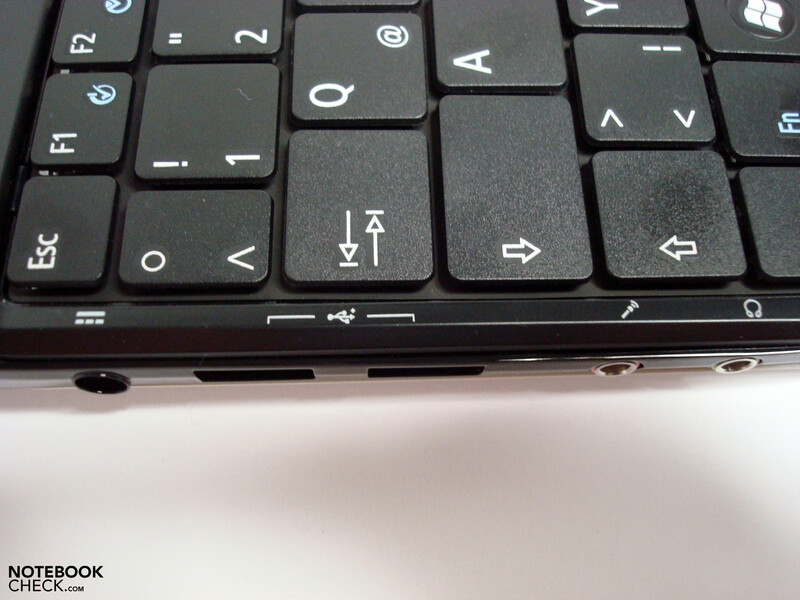 The touch pad key is slightly countersunk and is not always optimally reachable for hefty fingers. 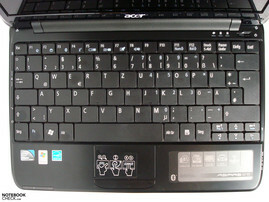 It only safely responds to input in the outer thirds due to the one-key-construction. In turn, it is pretty smooth-running and should not pose any problems after some getting used to in most cases. The case, which seems pretty wide and not very deep - a consequence of the featured 11.6" WXGA (1366x768 pixels) LED-display in 16:9 format, is the Aspire One 751's main eye-catcher. This aspect ratio increasingly establishes itself as standard, not only in the field of computers, despite the fact that it is hardly found in that of cinemas anymore. The display used in the test model is manufactured by AUO and features a reflecting surface. This creates glossy effects that subjectively seem somewhat less strong compared directly to the Aspire One D250's screen, but it does show them. It is also only suited for indoor usage, due to the comparatively low average brightness of 171 cd/m². The model features very good illumination of 91%, completely following the current LED-panels' reputation. No building of clouds can be observed, even on mono-colored backgrounds. 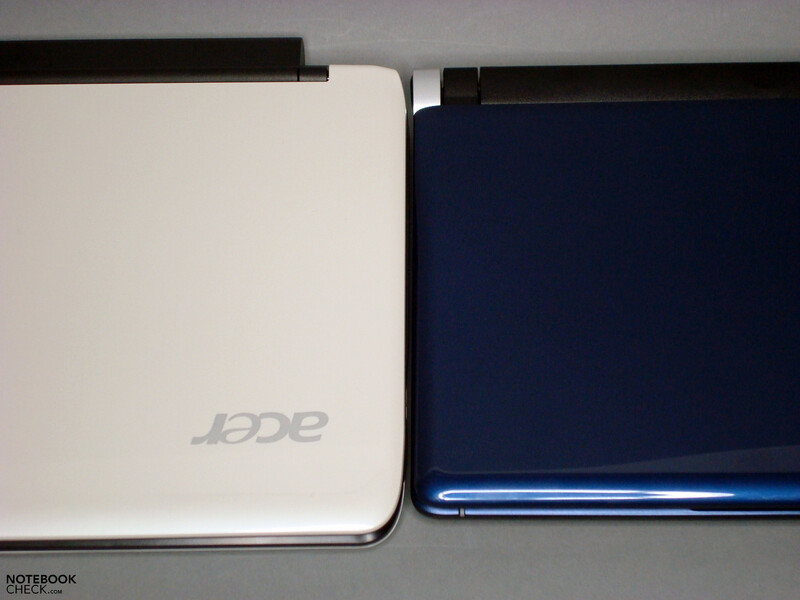 The Aspire One 751's colors seem visibly paler, despite the somewhat higher contrast range of 197:1 and more saturated black, compared to the Aspire One D250. Moreover, our test device had a strongly yellow-tinged display of colors in its as-delivered condition, which we could albeit correct in the color management with a couple of clicks for household use. Those placing heightened value on correct display of colors will not get around calibrating - as with any other display. 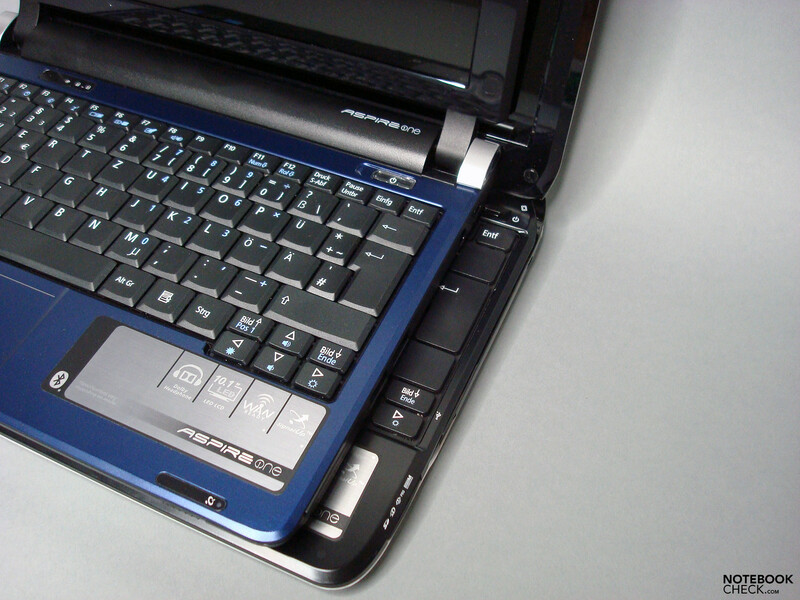 Since the computing power is not fit for editing images or videos anyway, the netbook's main purpose will be using office software and browsers. One has considerably more space on the desktop here due to the higher resolution and can indeed position two smaller windows next to each other. The stability of viewing angles is completely within the class' average and has to struggle with quick distortions in the vertical area. This is indicated primarily by fading or inverting colors. While the horizontal stability is not as sensitive, it does show early distortions of color at overall clearly visible image contents. In comparison to the combination of Intel Atom N270/GMA950, one has to accept considerable curtailments as far as the system's performance is concerned. 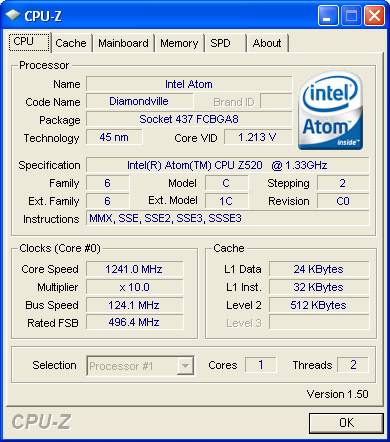 The Intel Atom Z250 CPU with a clock rate of nominal 1.33 GHz in connection with the Intel US15W chip set and GMA 500 chip set graphics are deployed for the Acer Aspire One. 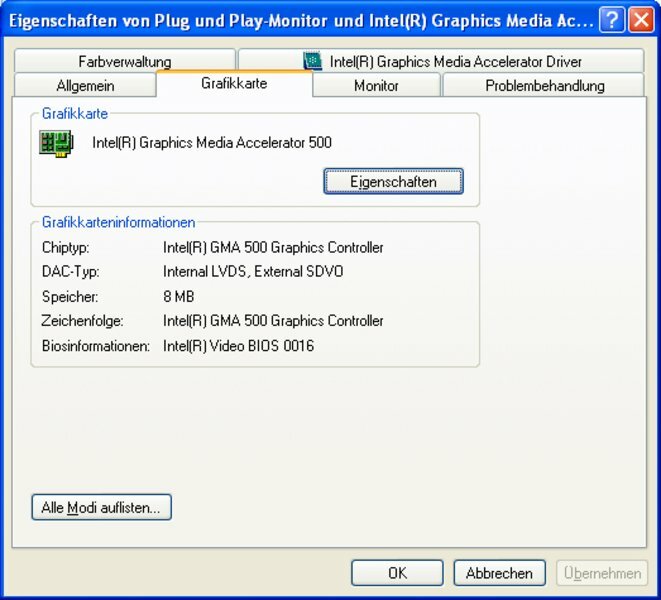 We already know a variation of this combination from Sony's P11 series, it currently is the weakest version of Intel's Atom platform. 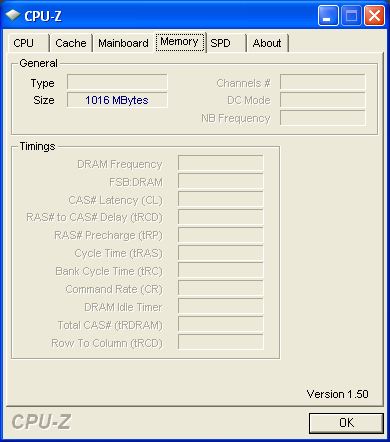 The equipment of only 1 GB system memory and the seemingly de novo downgraded clock rate of the CPU (from which we could elicit a maximum of 1.24 GHz instead of 1.33 GHz) are also barely helpful here. 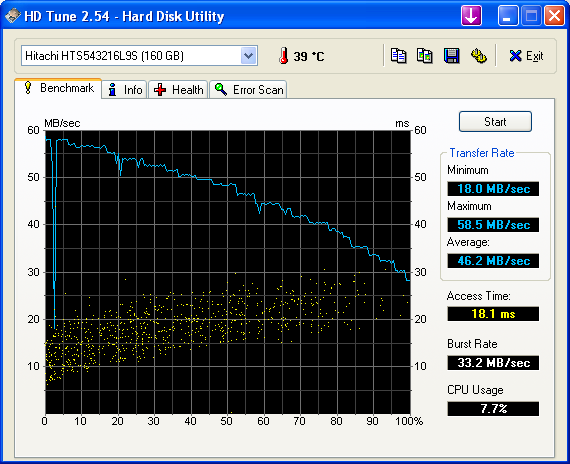 The Hitachi hard disk with an average data transfer rate of 46 MB/s is admittedly not among the fastest, but it delivers a sufficiently quick performance, especially as the real bottleneck is found at CPU and GPU. The technical data of the components are already inauspicious, and they achieve correspondingly bad results in the benchmark tests. The results of 3D Marks '01, '03, and '05 are at the bottom of the scale of our compared devices with 886, 395, and 136 points. They do not let any 3D-heavy software come into question as possible field of application. This estimation is impressively supported by the painstakingly reached 27 points in Cinebench R10 Open GL Shading, they only permit a respectful bow towards the fact that the test was completed without problems at all. 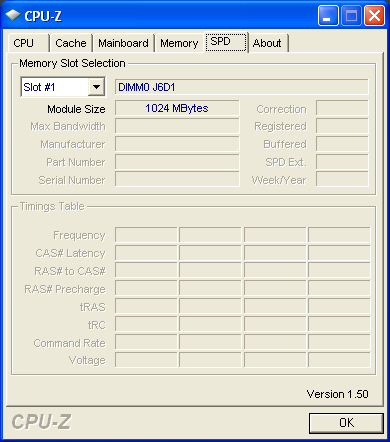 Upgrading the system memory to 3 GB does not help here, since the results only show a a difference of some points (3D Mark01 / 908 points, 3D Mark03 / 396 points) which are thus within the frame of measurement inaccuracy. The CPU test's result is similarly weak, the system needs 6708 seconds for the 32M Super Pi computation, which is about 30% longer than Intel's Atom N270 CPU with a clock rate of 1.6 GHz. The differences are similar for the Cinebench R10 CPU Rendering Test, our Z520 CPU could only reach 424 points at the Single CPU Test, and 661 points at the Multi CPU Test. Upgrading the system memory does not help here either. It is recommendable nevertheless, since a perceptible boost of performance can at least be reached in the field of application performance. 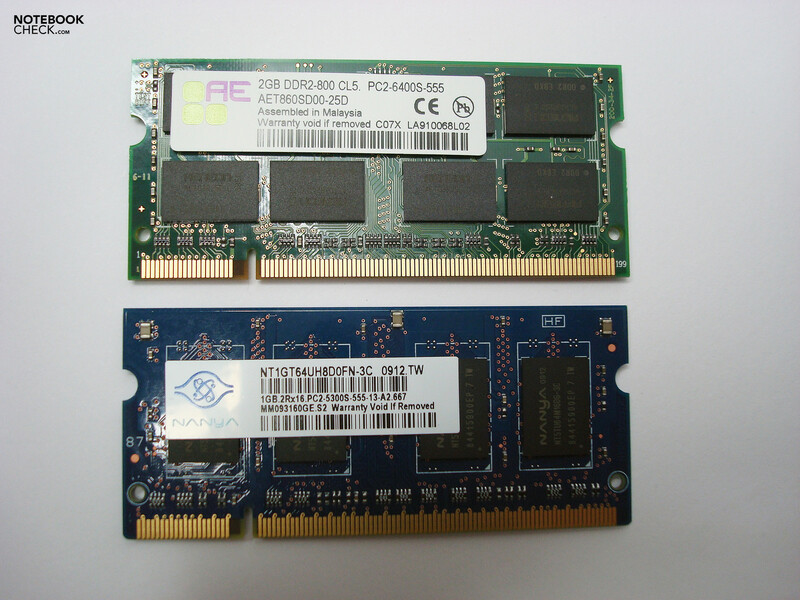 We reached a meager 692 points in PC Mark '05 with 1 GB system memory in the standard configuration, whereas the value could be increased considerably with an alternatively installed 2 GB module. Those are only barely classifiable values in theory, but they entail extensive limitations in practice. So, what can the Aspire 751 deliver? Using a browser or an office application and listening to music on iTunes at the same time works, doubling the system memory also helps in this sphere of action, it visibly renders what happens on the desktop more fluent. We already have a CPU load of 50-80% even in this field (browser and iTunes) nevertheless and see that there is no air for much more. Converting 5 test songs from MP3 to AAC virtually ran at real time speed x 1.1, it is thus about four times slower than the parallel tested Aspire One D250 with a N270 CPU. Our H.264 test movie "Shooter", which was at hand with a resolution common for iTunes (853x354 pixels), could only be played back as a slide show especially during the action-heavy sequences. Both image and sound had phases of interruption of several seconds even with reduced display resolution which were far from a fluent performance. Doubling system memory admittedly provided a visible improvement, but the interruptions could not be reduced to a tolerable extent. The combination of CPU and GPU (Z520/ GMA500) is just too weak for that, it is furthermore quickly pushed to its performance limit through the high native resolution of 1366x768 pixels. This is a pity, since the WXGA display in the 16:9 format offers a resolution fit for practice and a desktop surface especially suited for one or another movie or some image editing. The USB ports' transfer rate can also be described as below average, the date transfer rate of 21.1 MB/s is far below that of good models, which deliver 30 MB/s. 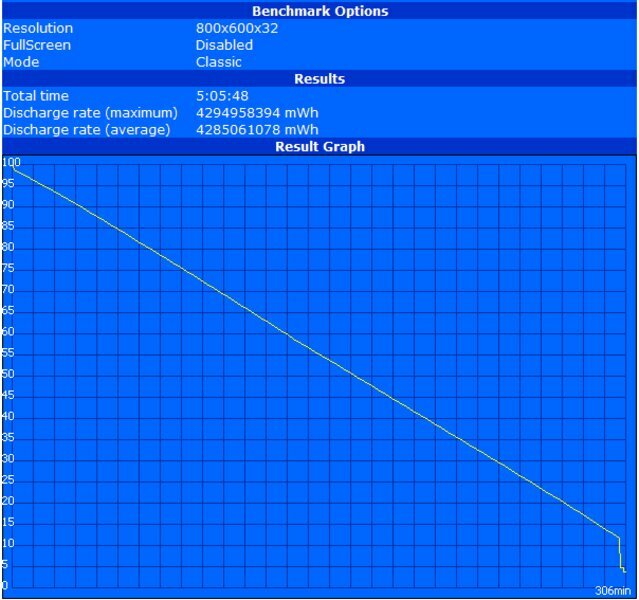 It is also still 5.6 MB/s below the performance we had on the Aspire One D250. Mass storage devices such as external USB hard disks are thus thwarted more than necessary and demand more patience than usual for data back-up, or moving data. 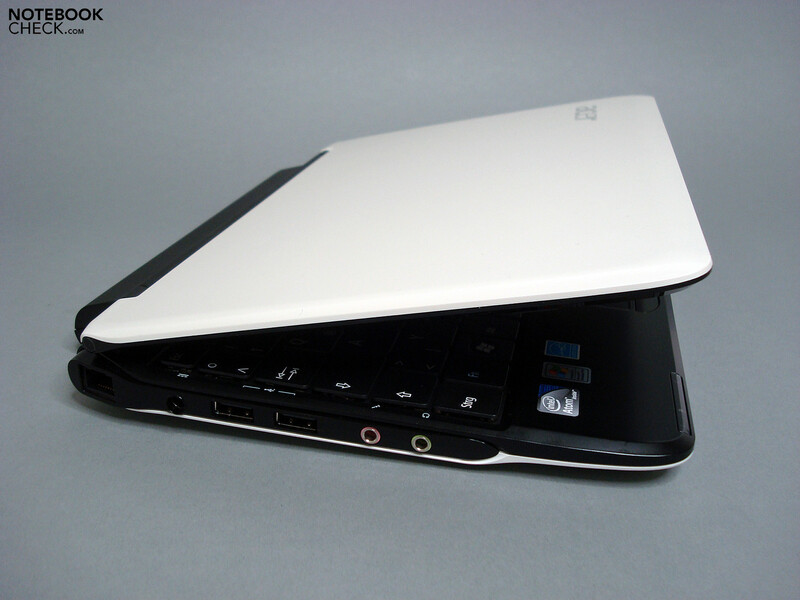 The Aspire One 751 features a quiet sound scape with a very good and discreet fan characteristics. The noise emissions are in an absolutely noncritical range with 29.6 to 31.1 dB(A) without load, they are only audible in quiet working environments. Even the maximally measured 34.7 dB(A) under full load are admittedly present, but they never become disturbing or unpleasant. Our test model has the temperature emissions well under control and benefits from both the modest hardware and the somewhat larger case (compared to the 10" faction). The device is to be described as altogether cool with a maximum of 34.6 °C measured in the center of the keyboard and 42.5 °C on the left side of the underbody. It only causes perceptible but definitely not unpleasant heating on the left thigh for "lap-surfers". (±) The average temperature for the upper side under maximal load is 32.2 °C / 90 F, compared to the average of 30.7 °C / 87 F for the devices in the class Subnotebook. (-) The average temperature of the palmrest area of similar devices was 28.6 °C / 83.5 F (-4.9 °C / -8.8 F). 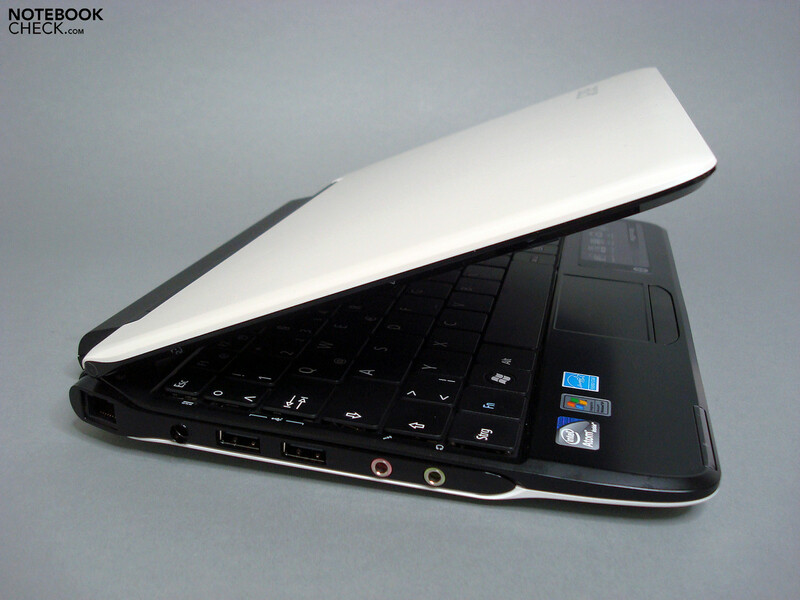 The integrated loudspeakers' sound output does not differ from that of the netbook competition, it is strongly treble-heavy, with almost non-existing middle tones and scarce bass and is thus sufficient for sorting music or piped music in the background. Those with higher demands can already reach considerable improvements with bargain USB-loudspeakers, or standard headphones. 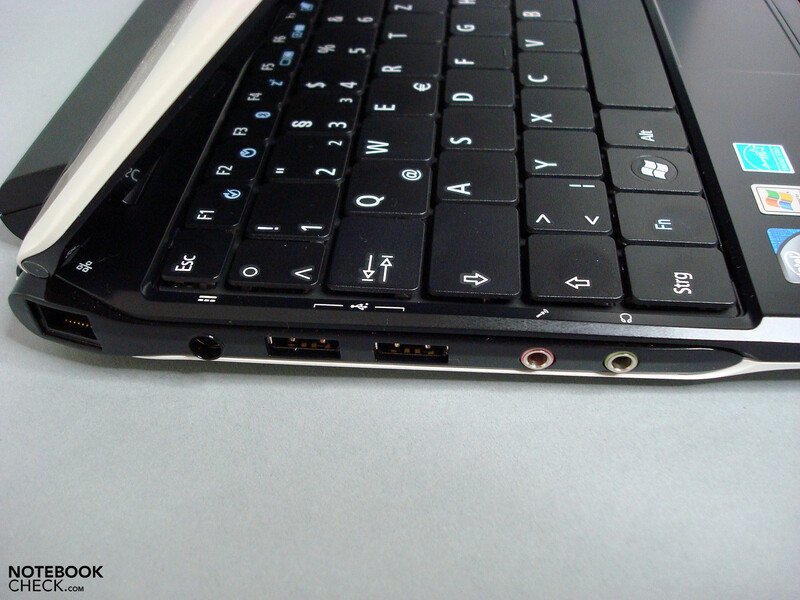 The acoustics via headphone jack show themselves very effectively and thus absolutely confirm Acer's marketing promises. The Dolby sound output is very rich in detail and balanced, so one quickly forgets all other audio alternatives and grabs the headphones. It is a pity that movie playback does not work as one would like it to, the Dolby headphones could really bring to bear here. The Aspire One 751's minimal power consumption with 11.6" display is at 5.6 Watt, which is a very good value for a total system. 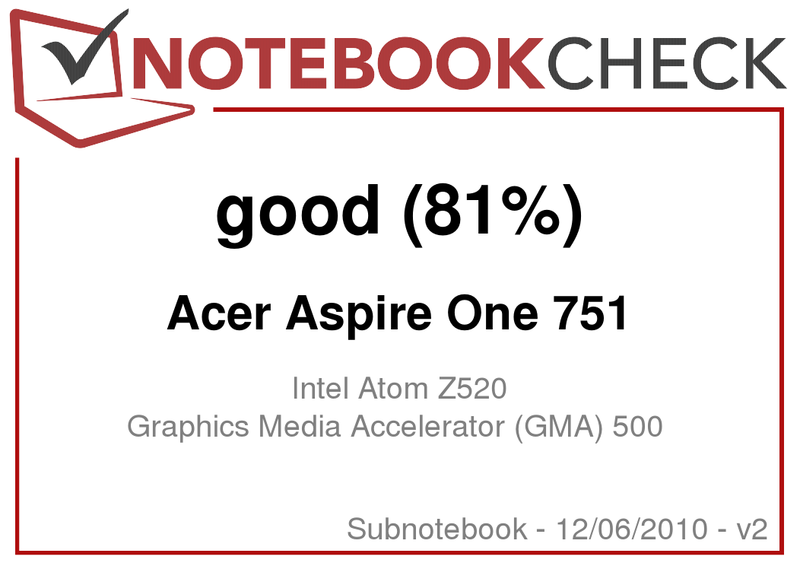 The combination of Intel Atom Z520 CPU and GMA 500, harshly criticized during the performance test, of course has a large share of this - they can now fully lead their trump. A possibly record-breaking battery life of 591 minutes in the Battery Eater Readers Test (maximum possible battery life) can be reached by the netbook (with the 6-cell, 54Wh battery at hand) with darkened display and switched off consumers like Bluetooth and WLAN. It is thus far above the promised eight hours - touché. Thus, the prestigious ten hour mark is only barely missed. This endurance-runner-performance is albeit bought dearly, it will only be reached by hardened permanent readers in practice. Both brightness of the display and system performance are just too low to still be able to speak of working relaxedly. If one adjusts these settings to a tolerable level, the device reaches 385 minutes (which is significantly less, but still good) in practical WLAN surfing with almost maximum brightness - a situation comparatively close to a full load scenario. 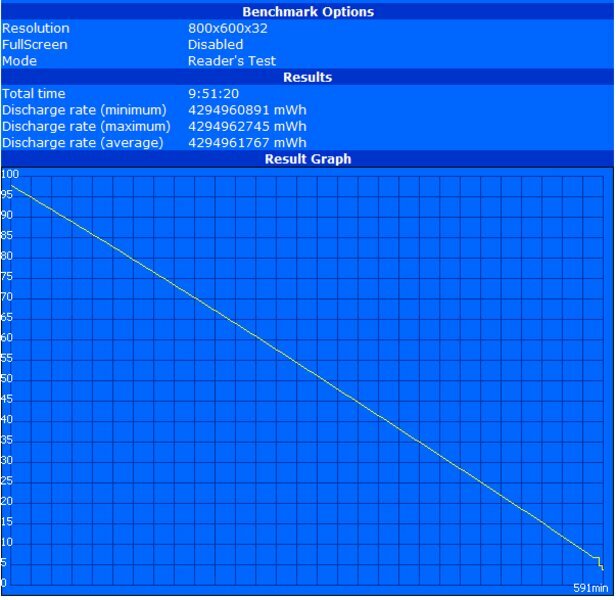 We test this with the Battery Eater Classic Test (all components switched on, minimum reachable battery life), as usual, and reach a battery life independent from the power grid of 306 minutes at maximum power consumption of 13.7 Watt. 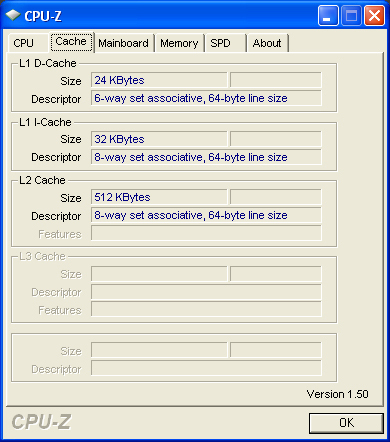 One notices that the developers really did make up their minds on some details, when it comes to the Aspire One 751. A lot of details that are useful in every-day operating have entered the overall concept, they truly are of additional value. 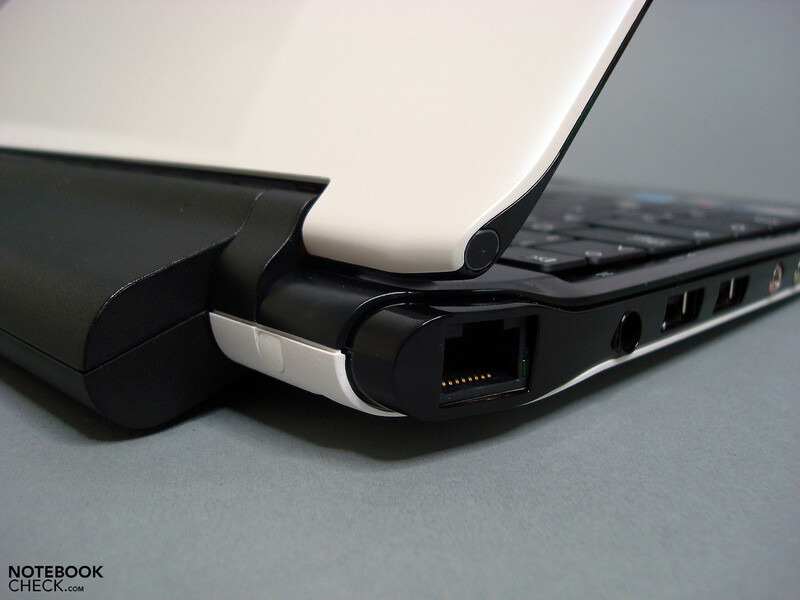 The labeling of the lateral ports visible from top view, the USB ports positioned with sufficient spacing on the left side, and the separate hardware switches for WLAN and Bluetooth are quickly valued. Unfortunately, the consequence to engineer the good basics the larger form factor provides in a more practical way went missing at some point. The extremely weak hardware, the sagging keyboard, and the inexpedient display demand great willingness for suffering from the potential user. Many fields of application that would principally be suited for this new class of netbooks are foreclosed by these weaknesses. All in all, one nevertheless gets a fancy, light-weight, and enduring 11.6" netbook, which offers a good price/performance ratio and is useful for easiest basic tasks by all means. The slim design, the low soundscape when working, and the display's high resolution. 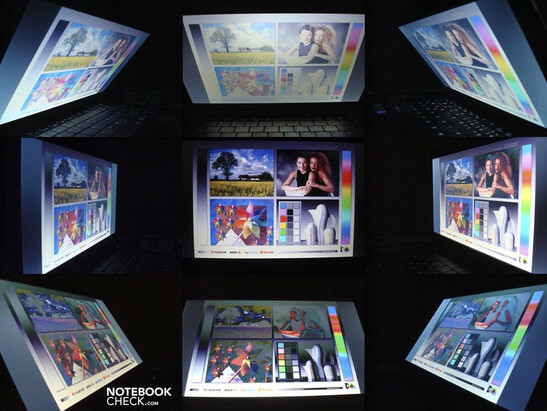 More powerful components and a better display with matt surface and saturated colors. That we found smartish solutions to details that are role models, despite of the weaknesses. ...does not exist, strictly in terms of the form factor. Among others, the Samsung NC10 and Asus Eee PC 1000HE come into question with similarly long battery life and low weight. 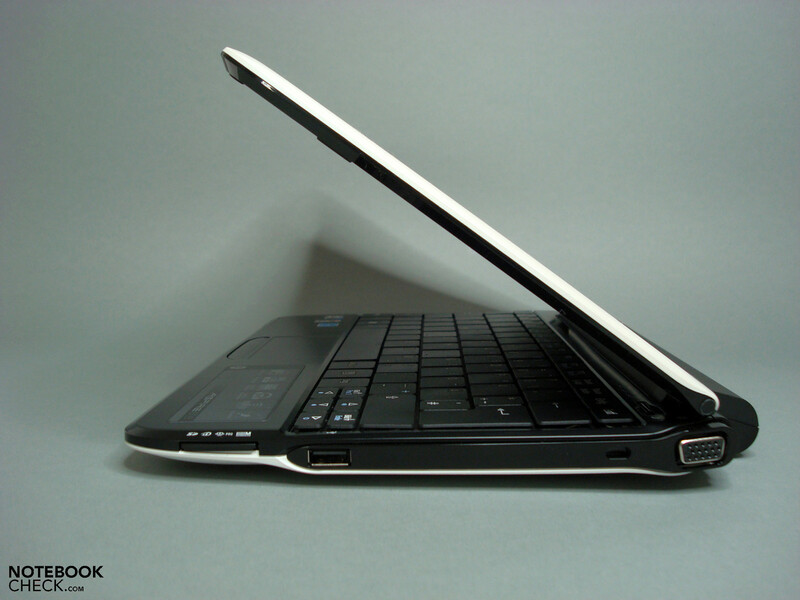 In the 12" segment, the Samsung NC20 and the HP Pavilion dv2 are worth taking a look at. The Dell Inspiron Mini 12 by now is not available anymore.